Measure the impact of HubSpot campaigns across every touchpoint in the customer journey. See how marketing activities impact product engagement, support tickets, sales conversions and beyond. 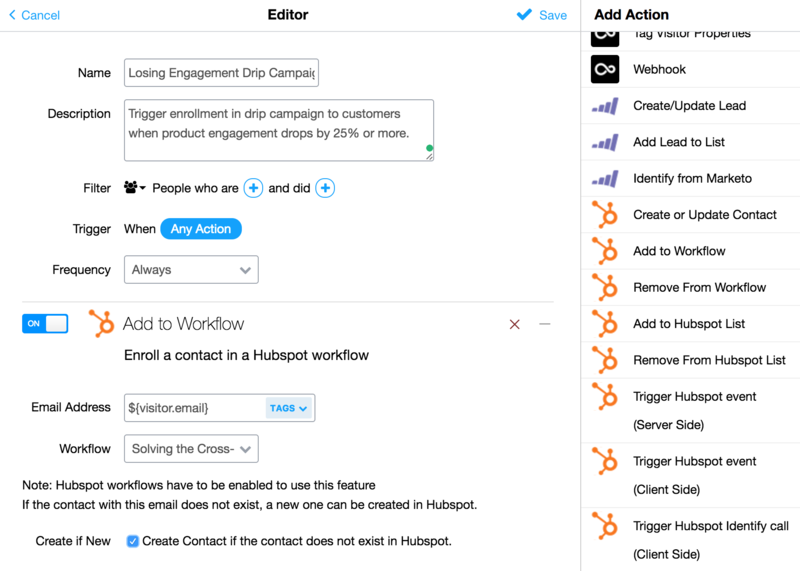 Fuel HubSpot campaigns with Woopra's behavioral data in real-time for unparalleled personalization, at scale. This integration requires both Woopra and HubSpot. Learn more. Dynamically enroll contacts in drip campaigns based on any combination of behavioral, demographic or engagement data. Automate email campaigns when customers drop below a healthy activity level or trigger a personalized landing page welcome message based on a visitor's industry, role and more! Understand the end-to-end customer journey, gain insights to design exceptional experiences and improve business outcomes by increasing customer loyalty and lifetime value. Slice and dice your data by dozens of cohorts to understand the who, the what and the why behind your analysis. This integration connects your HubSpot data with other valuable customer touchpoints, allowing you to measure full-funnel attribution metrics, leverage product data for lead qualification and understand the impact of marketing campaigns on the total customer journey. With this data unified in Woopra, you can also sync custom audiences in real-time from Woopra to HubSpot based on who people are and what they do. These lists can be, for example, automatically enrolled in a drip campaign to reach the right user, with the right message, at the right time.